KEY FEATURES: Slender vine. LEAVES opposite, 2-3 leaflets and slender 3-branched tendril; LEAFLETS wide-oval, to 10x7cm, papery, base rounded, tip sharp. FLOWERS large clusters; orange, slender tube to 6cm; lobes 5 (2 fused), linear, to 2cm, rolled back. 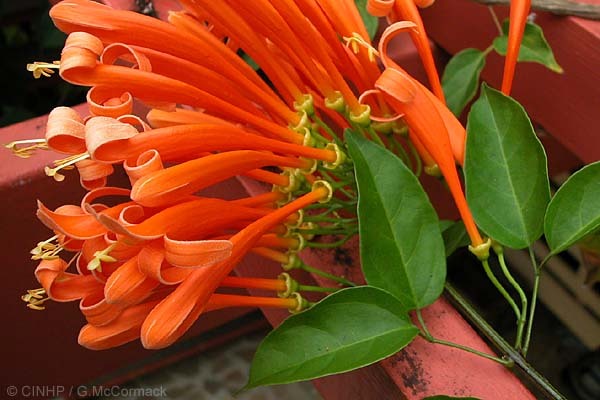 SIMILAR SPECIES: Cape Honeysuckle (Pyrostegia venusta) has compound leaf with leaflets 5-9, toothed (vs leaflets 2-3, without teeth); tendril absent (vs sometimes present). IDENTIFICATION: Vine. LEAVES opposite, compound, with leaflets 2-3, or 2 plus tendril; stalk to 5cm; LEAFLETS wide-ovate to 10x7cm, papery, base rounded, tip drawnout. 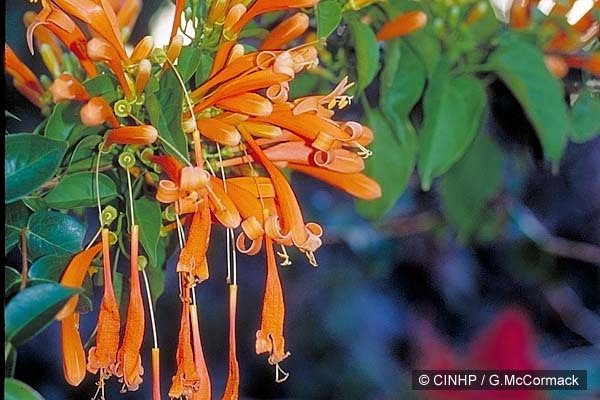 FLOWERS dense clusters, orange; slender tube, to 6cm; lobes 5 (incl. 2 fused), oblong, 2cm, rolled back. FRUIT narrow cylinder to 30cm, seeds winged (not seen). Rarotonga: fieldspecimen+photo, Sue Carruthers garden Muri, on balcony, 1/2003, ID Sue.